Since its invention in 1925, t Since its invention in 1925, the A-Series continues to be the cornerstone of Schlage's product line and sets standards by which the industry is bound. Worldwide acceptance and use of the A-Series are testimony to the precision and integrity of its design. A-Series Door Knob locksets are constructed of high strength steel and plated for superior corrosion resistance and maintenance-free performance.he A-Series continues to be the cornerstone of Schlage's product line and sets standards by which the industry is bound. Worldwide acceptance and use of the A-Series are testimony to the precision and integrity of its design. A-Series Door Knob locksets are constructed of high strength steel and plated for superior corrosion resistance and maintenance-free performance. Push-button locking. Can be opened from outside with small screwdriver turning inside knob or closing door releases button. 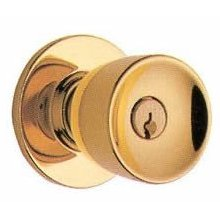 Latch Bolt: Brass, chrome plated, ½Ý throw, deadlocking on keyed and exterior functions. Cylinder & Keys: 6-pin Classic C keyway, keyed 5-pin. Warranty: Commercial: three-year limited. Residential: Full mechanical lifetime. All levers with returns comply; levers return to within 1/2"
All locks listed for A label single doors, 4´ x 8´. Letter F and UL symbol on latch front indicate listing.